LSU celebrates after the game-winning shot. With just seconds left, Tremont Waters drove the lane and threw the ball up underhand. 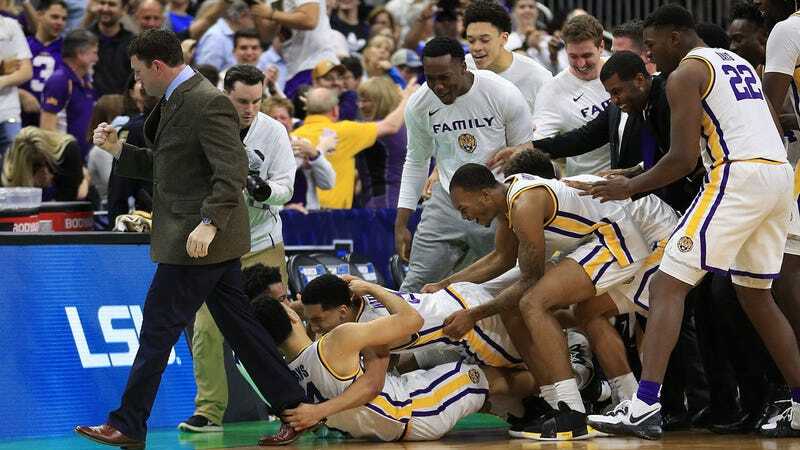 It banked in, and LSU is going to the Sweet 16. The Tigers beat Maryland, 69-67. Nice. LSU, the No. 3 seed in the East region of the NCAA tournament, blew a 15-point first half lead and fell behind sixth-seeded Maryland after the Terrapins went on a 12-1 run over about five minutes. Then it was back and forth. Maryland’s Eric Ayala hit a three, but Skylar Mays answered. Bruno Fernando hit a layup for the Terps, but Javonte Smart came right back for the Tigers. After two free throws put Maryland ahead, LSU tied it with a pair of Skylar Mays free throws that came out of a thrilling sequence. If Maryland got the rebound there, or a foul wasn’t called, the end result could have been different. Mays came right back the next possession and hit a three to put LSU up three. But then the Terrapins five-star freshman, Jalen Smith, hit a three from the corner to tie it—setting up the final play. LSU, of course, is playing without coach Will Wade after he was caught on a wiretap talking about paying Smart.